classic closed or mostly closed humid terrarium. 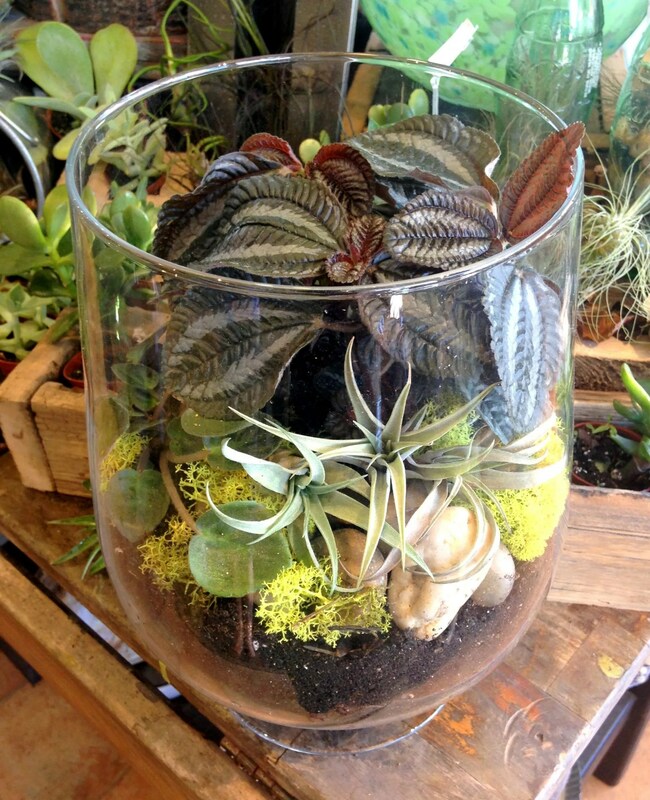 Keep your little glass garden well away from direct sunlight. You want the ambient light of the room bright enough to read by in the late afternoon. Think a north facing window or east one that is mostly blocked by a tree. If you find you get too much direct light or there’s nowhere but directly on a west or south sill for the planter to sit, you can tweak the strength of the light by hanging a sheer curtain or getting a pretty plant stand to set the container out of the reach of the sunbeams. Watering can be daunting, but it’s pretty easy to get the hang of it since you can see right into your dirt and layers of reservoir pebbles. The goal is to water enough to saturate the soil in the pot without there being enough to seep into the bottom pebbles. So when you look at the sides of soil you should see a nice evenly dark and moist looking earth that half clings to the glass. If it’s pale brown and the sides have pulled away from the container, your plants have dried out! If, on the other hand the soil is black, there are zero pockets of air between the glass and there is run off sloshing around between the pebbles, you have brought forth a monsoon and should give the whole thing a chance to dry out. Finding a balance between the two just takes some attention and patience. It’s best to check it every other day at first to get used to how fast it dries out. Before long you’ll have a schedule and amount figured out. These are signs your plants are under-watered. Increase the amount or frequency of watering and give them a mist. These are signs your pants are over-watered. Reduce the amount or frequency of watering and make sure the soil surface dries out a bit before the next water. are much easier to care for, their only downfall is it’s so easy you might forget to do it! Keep open terrariums in direct sunlight for at least a few hours a day. Make sure any glass walls taller than the soil are not between the plant and the sun as the heat can be intensified and fry them. Watering can be harder to track since you let them dry right out between waterings so you aren’t looking for a visual cue in the soil. A good rule of thumb is in the summer (growing months) water once a week to 10 days. In the winter (dormant months) water every two weeks. For all cactus arrangements you can water even less with once every two weeks in summer and once a month in winter. Again, you want to make sure you’re only watering enough to saturate the soil without runoff in the bottom. Because cactus and succulent soil is coarser and faster draining, they don’t hold as much moisture as regular potting soil so an open terrarium won’t require as much water to saturate as a closed one. These are signs your plants are under-watered. Increase the amount or frequency of watering. 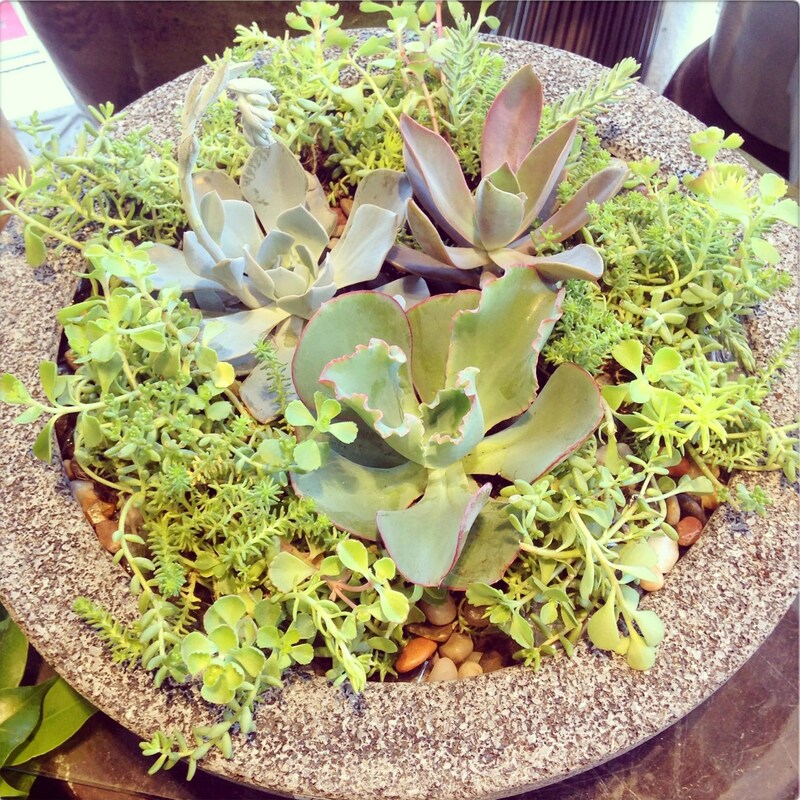 Cacti and succulents don’t need to be misted. It is very unlikely a cacti will be under-watered unless it’s been months since you last gave it a drink. These are signs your pants are over-watered. Reduce the amount or frequency of watering and make sure the soil surface dries out a bit before the next water. You can also try to increase the amount of sunlight it gets in a day so it will dry out more. 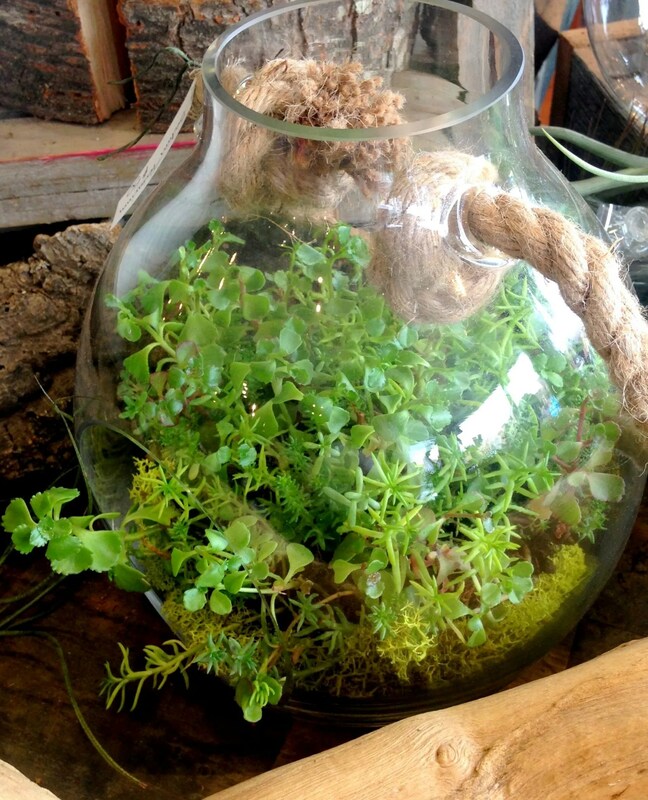 Join us for our next Terrarium Workshop on September 2nd 2015!!! Call the shop at 613-729-6911 to reserve your spot. $25 per person.